judged by a panel of fashion experts from throughout the state, with the selection of one new coed as Miss Perfect Profile highlighting the evening. Foreign Student Program. This is another active AWS committee which works with members of the International Center Association. This group works hand-in-hand with our overseas students who number about 200 and who are representatives of some fifty different nations. Students of different nationalities prepare their native dishes and entertain at student dinners with ticket sales open to all students. Another phase of this committee's work is the planning and promotion of the International Festival which provides the students of other nations with the opportunity to display some aspect of their native culture. This program provides a real opportunity to know students from other lands. Student-Faculty Relation. It is the aim of this group to make possible, in various ways, opportunities for students and faculty to become better acquainted. Spinster's Spree. 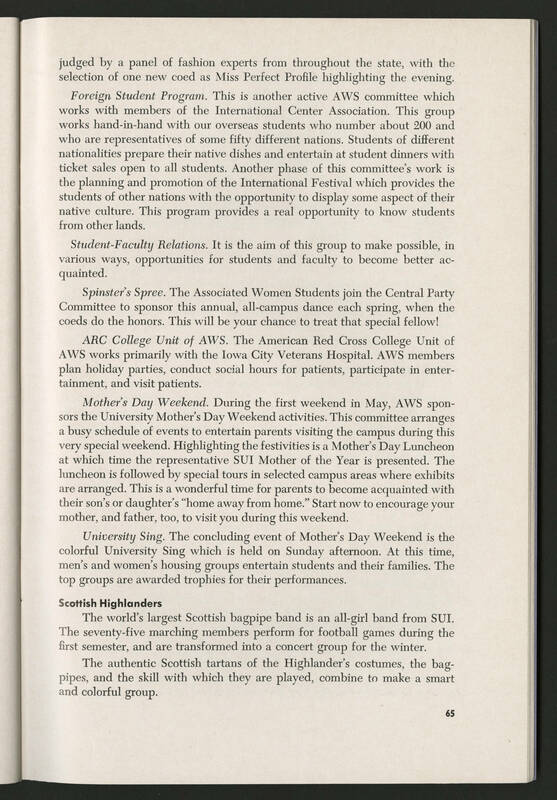 The Associated Women Students join the Central Party Committee to sponsor this annual, all-campus dance each spring, when the coeds do the honors. This will be your chance to treat that special fellow! ARC College Unit of AWS. The American Red Cross College Unit of AWS works primarily with the Iowa City Veterans Hospital. AWS members plan holiday parties, conduct social hours for patients, participate in entertainment, and visit patients. Mother's Day Weekend. During the first weekend in May, AWS sponsors the University Mother's Day Weekend activities. This committee arranges a busy schedule of events to entertain parents visiting the campus during this very special weekend. Highlighting the festivities is a Mother's Day Luncheon at which time the representative SUI Mother of the Year is presented. The luncheon is followed by special tours in selected campus areas where exhibits are arranged. This is a wonderful time for parents to become acquainted with their son's or daughter's "home away from home." Start now to encourage your mother, and father, too, to visit you during this weekend. University Sing. The concluding event of Mother's Day Weekend is the colorful University Sing which is held on Sunday afternoon. At this time, men's and women's housing groups entertain students and their families. The top groups are awarded trophies for their performances. Scottish Highlanders The world's largest Scottish bagpipe band is an all-girl band from SUI. The seventy-five marching members perform for football games during the first semester, and are transformed into a concert group for the winter. The authentic Scottish tartans of the Highlander's costumes, the bagpipes, and the skill with which they are played, combine to make a smart and colorful group.